Hurricane Harvey continues to dominate day to day operations in the District E office. Staff continues to work with Houston Public Works and Harris County Flood Control District on projects to reduce the risk of flooding in both parts of District E. Recently Mayor Turner took the time to sit down with Representative Dan Huberty, Senator Creighton, and myself to discuss a plan moving forward to address major flooding in the Lake Houston Area. All parties in the meeting agree that the dredging of the River and Lake are necessary due to the settling of sediment which has created islands and sandbars blocking the natural flow of the River. Other items discussed included the construction of flood control gates on Lake Houston. Additionally, the effects of sand mining along the San Jacinto River were a topic. Representative Huberty passed crucial legislation in the 82nd Texas Legislature to put harsh regulations on illegal sand mining operations and is now working with the Texas Commission on Environmental Quality to increase enforcement of those regulations. The Lake Houston Area sits at the bottom of the San Jacinto Watershed which is comprised of nearly 452 square miles. The ten tributaries that have a significant impact on flooding in the Lake Houston community include: Lake Creek, Spring Creek, Cypress Creek, Caney Creek, Peach Creek, East Fork of the San Jacinto River, Tarkington Bayou, Luce Bayou, West Fork of the San Jacinto River, and Lake Conroe. Currently, the Lake Houston Spillway Dam has no flood control measures as part of its infrastructure. The Spillway consists of two radial gates and two flashboard gates. This puts our area at a huge disadvantage in storms like Harvey because we have ten other tributaries filling up the watershed and barreling down the San Jacinto River in to Lake Houston from the west and east. The City of Houston is considering a proposal that would add eight tainter gates to the Lake Houston Spillway Dam which will greatly increase the amount of water that can be released during inclement weather. The dredging of the San Jacinto River and Lake Houston along with a request for funding of additional gates at Lake Houston will be submitted to the Texas Water Development Board by the City of Houston. In the south part of District E, there are six storm drainage and water sewer projects on the Capital Improvement Project Plan scheduled to begin over the next four years. These projects will greatly transform the drainage of Arlington Heights, Freeway Manor South, Freeway Manor North of Edgebrook, Gulfway Terrace, and Crenshaw from Shaver to Allen Genoa. These projects in the south sector add up to more than $50 million dollars in improvements for the area. In addition to the Capital Improvement Projects mentioned above, Council Member Martin and staff continue to work with Chief Resiliency Office Stephen Costello to identify future local drainage and Storm Water Action Team projects. These projects will all work together to benefit the area and reduce effects of future flooding. If you are aware of severe street ponding or poor drainage in your community please contact our office for assistance. Council Member Martin is working adamantly to stop not just the next thousand-year storm but the next Tax Day and May Events we endured in 2016. As always, it is a pleasure to serve you. Please contact the District E office if we can assist you in any way by contacting our council office at districte@houstontx.gov or by calling (832) 393-3008. Members of the public are invited to attend to hear from various city departments as well as community representatives about ongoing projects, issues and community news related to District E. In addition to discussing CIP projects, post-Harvey updates will be provided from various departments and local agencies. For more information, please contact Council Member Martin's office at (832) 393-3008 or by email at districte@houstontx.gov. The events are free and open to all City of Houston residents and will be held rain or shine. A valid Texas driver's license or other proof of residency, such as a water bill, will be required. In addition to B.O.P.A. items, residents may drop off scrap metal and large appliances. Large appliances include stoves, refrigerators, freezers and air conditioners. •ACCEPTED ITEMS: rechargeable, Lead Acid, NiCad and Lithium Ion batteries, used motor and cooking oil (15 gallon limit each), antifreeze (15 gallon limit), latex paint (15 gallon limit), appliances and scrap metal including refrigerators, freezers and air conditioners. •ITEMS NOT ACCEPTED: Alkaline batteries, electronic waste, oil-based paint, paint without labels, household hazardous waste/chemicals, business waste, medical waste, radioactive waste, PCB's, Dioxins, ammunition, explosives, compressed gas cylinders, smoke detectors, household trash or tires. Please also note that there is no need to bring empty latex paint cans or those that have hardened. These can be discarded with household garbage. Residents may call 3-1-1, the City of Houston's Customer Service Hotline, for additional information or check online at www.houstonsolidwaste.org. More information on the Solid Waste Management Department and its services is also available on Facebook and Twitter. On Thursday, February 8, Council Member Dave Martin had the opportunity to present the City of San Antonio with a proclamation and award to recognize their efforts in the Kingwood area following Hurricane Harvey. The City of Houston commends and appreciates the City of San Antonio for their compassion during a historic disaster, as their selflessness is greatly appreciated by many people who benefitted from their unwavering generosity. Council Member Martin extends his gratitude to Mayor Ron Nirenberg, Solid Waste Director David McCary, the entire City of San Antonio - Municipal Government for allowing him to represent the City of Houston and Mayor Turner at their council meeting to declare February 8, as "City of San Antonio" Day in the City of Houston. City Council Member Dave Martin is requesting residents participate in providing public input on proposed changes to Chapter 19 of the City's Code of Ordinances. The City of Houston is considering revisions to Chapter 19 to ensure new dwellings are built high enough to save lives and property in the event of future flooding. As District E will be heavily impacted by new regulations, participation from residents is highly encouraged. The deadline to provide feedback is Monday, March 5 at 5:00 p.m. The City of Houston hopes to reduce the risk of flood loss for future development and redevelopment by ordinance revisions, new regulations, building codes and design guidelines. Existing development will be improved through Capital Improvement Projects, buyouts, home elevations and demo-rebuilds. Buyouts will be determined based on repetitive flooding and are only considered when residents volunteer to participate in the program. Additionally, home elevations utilizing pier and beam methods are being researched by Houston Public Works. Houston's current code only applies to property in the 100-year floodplain and protects 1 foot above 100-year flood elevation. The proposed revisions would include property in the 500-year floodplain and protect "X" feet of 500-year flood elevation. It would also include no net fill in the 500-year floodplain. "X" feet in the proposed revisions is still to be determined following the public input period. It is believed that the City is looking at changing the ordinance to 2 feet above the 500-year floodplain, but the City would like input on if that is too much or too little. The 100-year floodplain is land that is predicted to flood during a 100-year storm, which has a 1% chance of occurring in any given year. The 500-year floodplain has a .2% chance of occurring. 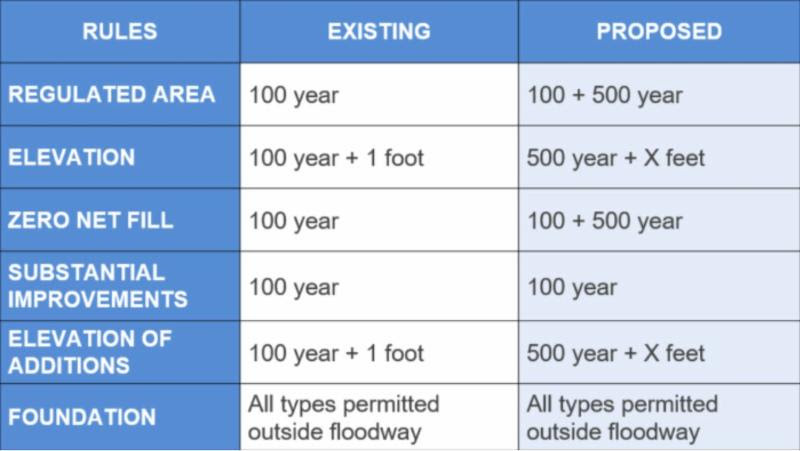 For residents outside of the 100-year and 500-year floodplain, these changes to the ordinance will have little or no affect. The ordinance will be presented to Council on March 21, 2018. The Direct Assistance for Limited Home Repair (DALHR) Program provides repairs to homes with moderate damage caused by Hurricane Harvey. This program is FEMA funded, but administered by the City of Houston Housing and Community Development Department. Repairs made under this program help homeowners remain in their homes, but are not intended to fully restore homes to pre-storm condition. Home repairs are limited to items like heating, plumbing, ventilation and air conditioning, walls, floors and ceilings. Structural repairs do not qualify. To check on your FEMA claim status, go to www.disasterassistance.gov or call 1-800-621-3362. More information about current HCDD programs can be found here, here and here. In January, Council Member Martin met with residents of the Kingwood community and Harris County Flood Control District (HCFCD) representatives were in attendance. As a result of that meeting, HCFCD committed to assessing the major drainage channels in Kingwood and has now created a Kingwood information page on their website. Following this link you can view the information gathered up to February 16. HCFCD has been working diligently to package projects in the most efficient manner. Currently, there is a silt removal project on Tributary G103-46-00 located in Forest Cove, leading into the San Jacinto River. After an environmental contractor conducted material testing on the sediment in the area, the soil analysis came back clean and the contractors were able to mobilize in the area on February 23. The contractors began the excavation and removal process in February 23rd, however there have been some delays due to the inclement weather. Once construction equipment can fully access the area, the project will begin to remove sediment to open up G103-46-00 to provide positive drainage. The anticipated duration of this project is 10-14 days, weather permitting. Following this link there is additional information and photographs of the project. HCFCD is also conducting channel assessments for G103-33-02 and G103-33-01 in Bens Branch, and will provide information about any work in that area on the website. As more projects come online. HCFCD will post them on the Kingwood information page with maps and description. In addition, our office will provide information as it becomes available utilizing social media and our monthly newsletter. HCFCD utilizes geographic information systems extensively to identify needed drainage network repairs and debris removal. Residents throughout District E can utilize this map to see areas identified for repair and debris removal. The purpose of these assessments is to identify damages caused by flooding and prioritize them for immediate and future repair. The HCFCD is utilizing this information to prepare requests for millions of dollars in additional storm related funding from federal partners like the Natural Resources Conservation Service.